Because there are so many garbage movies currently playing I took a chance on this one. Hey, it won Best Picture. It has to be good, right? Wrong. Slow, boring, gratuitously far fetched (come on, who questions a 6 yr old on his sexuality? No one!) bad acting - this turkey has it all. REALLY BAD. The Academy gave this Best Picture if only because they felt they had no choice but to pick a movie, any movie, having mostly black actors in it. Mission accomplished. Unless you are hopelessly sympathetic to all things gay (I am not; I could care less) AVOID AT ALL COST! For those who gave this dog 5 stars ( or more than 1) - grow up.Its no one's fault you were born confused. But misrepresenting this as 5 star is wrong on so many levels. Shame on you. 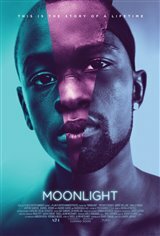 Coming of age is even harder when you are gay, black and your mom is a crack addict, but Chiron finds unlikely help in Liberty City i the 90's, Miami's toughest section.Wonderful acting and sensitive in its look at homosexuality where it is least tolerated. I liked the brilliance of the director's creation of intimacy. I loved the characters. I loved the castin and acting. Th only thing I had rouble with was bwlieving thaqt the last actor in the grown-up phase of the protagonoist's life was the same physical person as the younger actor's in the boy's earlier life. You just have to foret the physical differences. I think one of the greatest scenes was the young man and his mother,her honesty in acknowledging her neglect of him. this was a compassionate andf intimate movie with great character portrayals and emtional depth.. Terrible movie! Do not waste your time or money. Cannot believe it won best picture! DISLIKED ALL OF IT! WORSE MOVIE OF THE YEAR!!!!! The kind of movie that opens your eyes. Amazing cast. Music that reflects the atmosphere beautifully. Stunning to watch this one particular child grow up. I was thrilled it was recognized at the Oscars. I didn't like this movie at all it really confussed me. I wouldn't see this movie any more I didn't think it was good at all. This is what film and characterization should aspire to be. Making ones way towards self realization under very difficult circumstances. And a really great score.